today Massive Voodoo went back in its deep jungle archives to bring you a small tutorial about how to create a Wall piece from plaster. 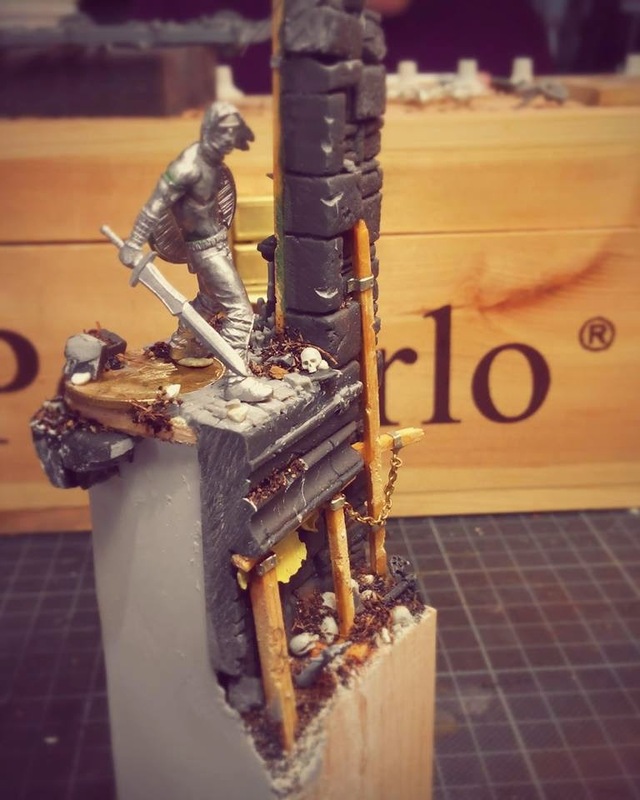 It is similiar to the article of Raffa on how to make a brick wall but in the same moment it is not similiar as other techniques and materials were used. Well, this article is written by Roman, BUT the person who builds up the base is Kurt, our friend from the Pumpkin Painters. Deep in the archives of the jungle Roman found the photos of Kurt aka DarkEzekiel working on his base while he was visiting us in Augsburg a long time ago. - Material to build a form/mold with. 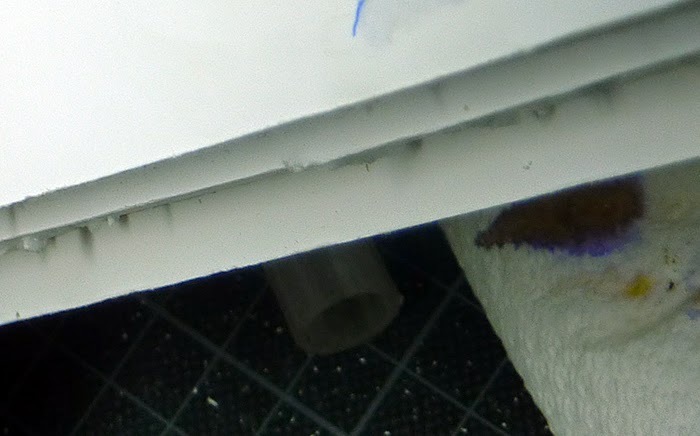 In this example the form was made from architecture cardboard. You could also do this with Lego for example. 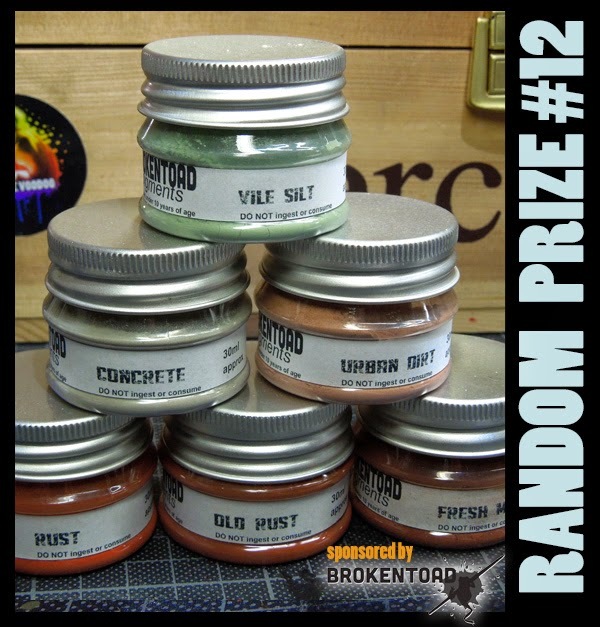 What kind of plaster should I use? We recommand using harder plaster, like dental plaster or kind of. 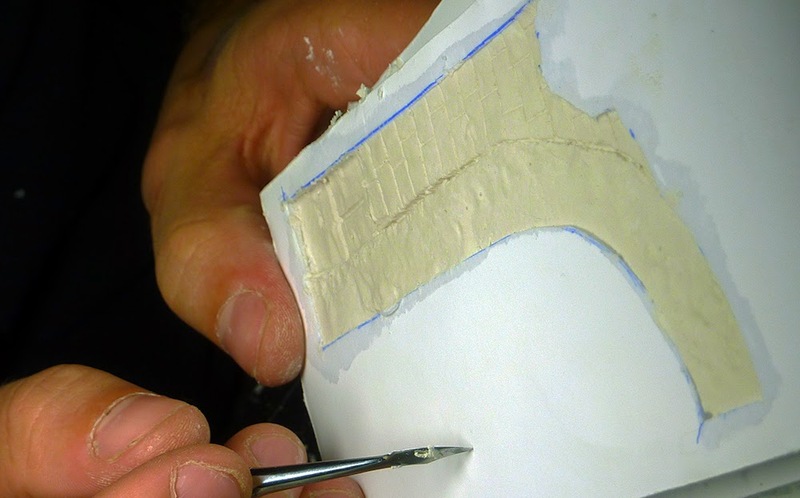 You can still carve it, but if you use too plaster that is too soft after drying you will encounter problems while painting your wall piece as the colours will get sucked into the material. Just annoying and demotivating. Think about which kind of wall you want to create and make a sketch of it. 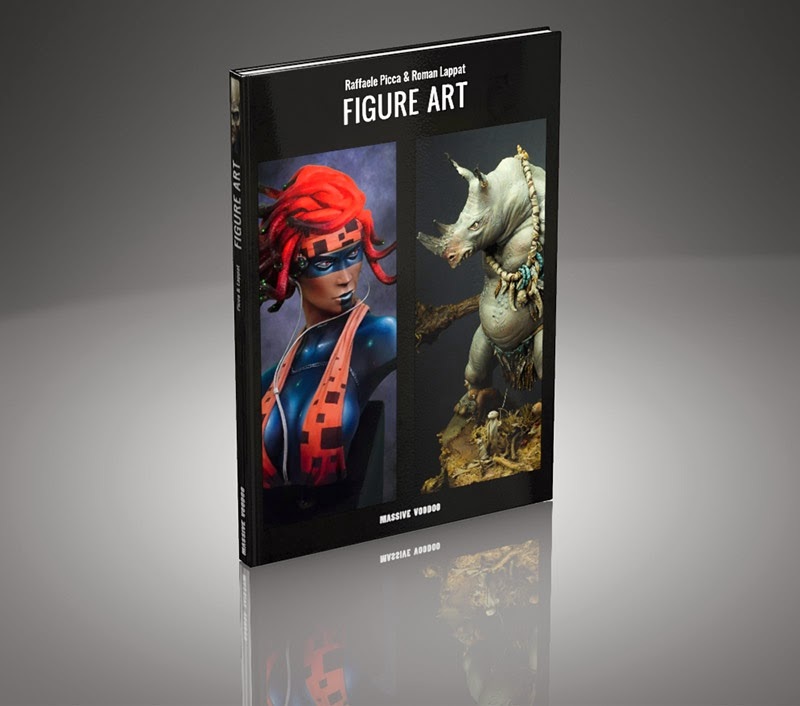 Try to find a shape that you like to create, take real life examples as reference if needed. Now take the architecture cardboard. The ones you can buy have different thickness and we recommand not taking the big ones. These used here were thick about one centimeter as far as I can remember and suggest. Kurt signed his wall shape to both of the cardboard-parts and cut out each single piece with a cutter. Take care and don't hurt yourself. Then he used superglue to put them together. You can already achieve a wall with one single piece of card board, but Kurt wanted a big column piece. 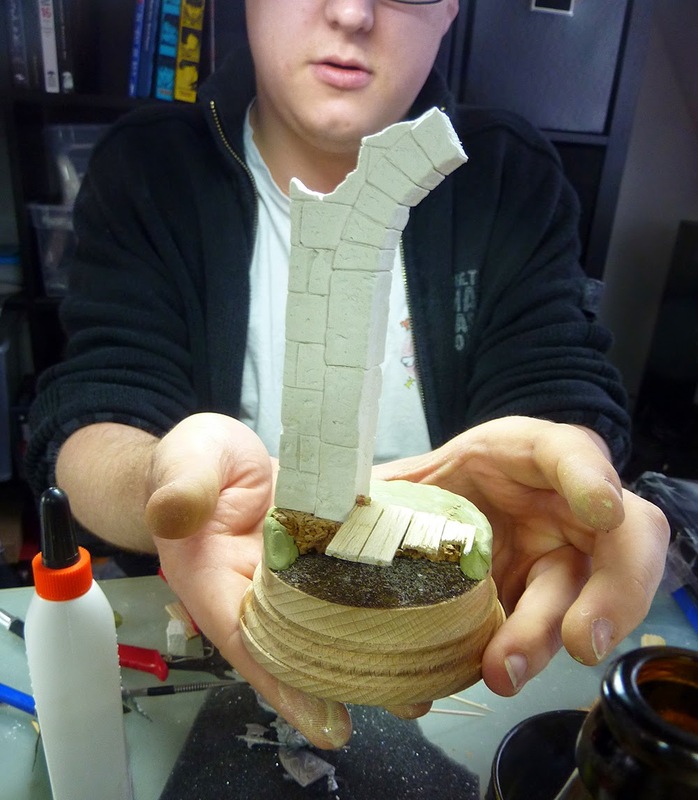 Last, he glued a full wall of cardboard to one side to close the mold. Three pieces in the end. 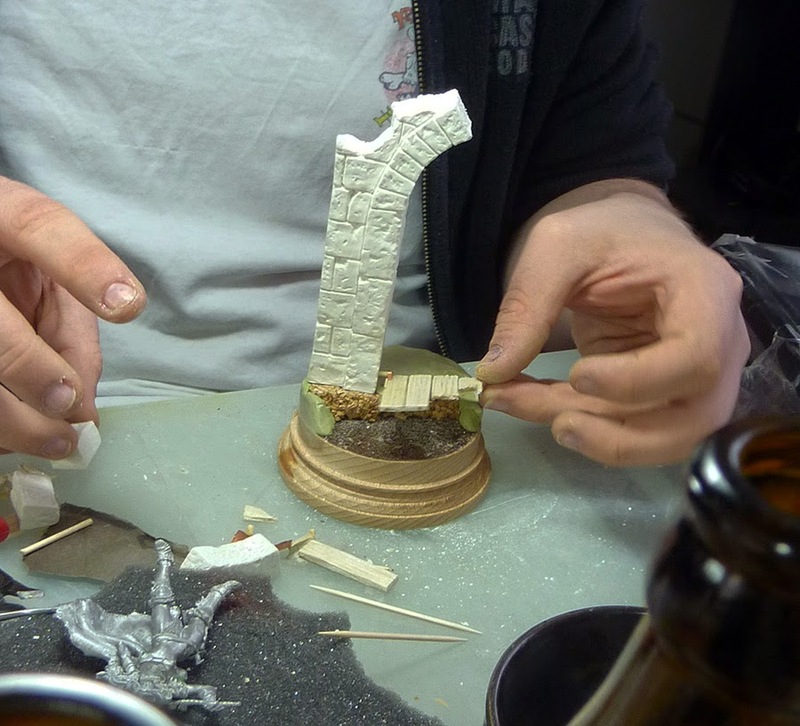 While glueing take care that everything is glued properly or you will have a mess later on. Sadly I can not provide you with a photo of the basic form itself as this went missing somehow. Really, this is coming from deep out of the past. Next, take a seperate bowl or plastic cup to mix the plaster with water like described on the plaster instruction. When mixed properly place the plaster into your form. You will recieve something that looks like this and after it is dry you can already start with carving your basic stones into the plaster. As the mold that Kurt made just allowed him to carve on the walls front side he had to work on the other sides still to make it an authentic wall piece from all angles. For sure, if you only do one side of a wall you are fine with carving one side. If you are done with the carving you can carefully cut away the cardboard to set your wall piece free and bring it to your base. If your wall piece is heavy, like the one of Kurt, than we recommend to pin it to your base. 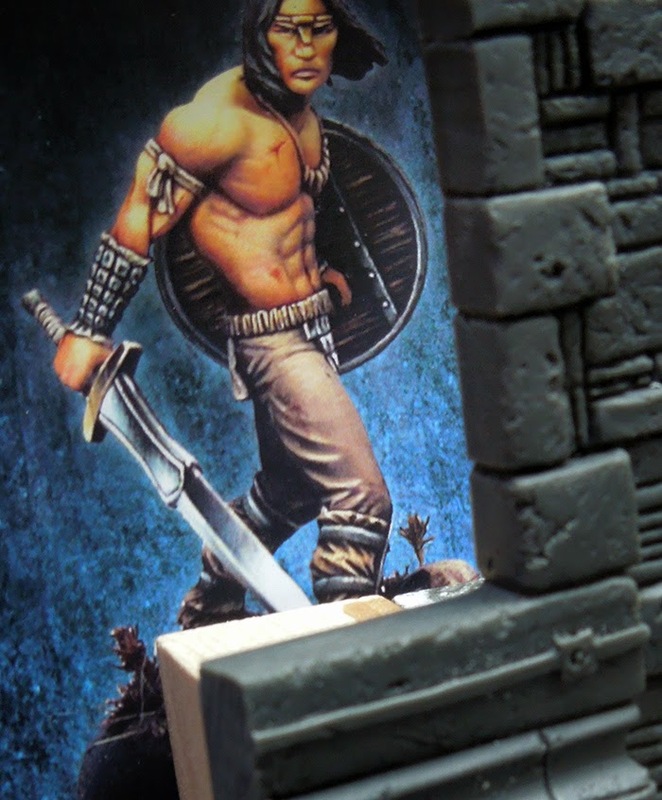 You can use Hirst-Art Parts or plaster rests to place some rubble on the ground. Well, that's it. Have fun with carving your wall of choice. 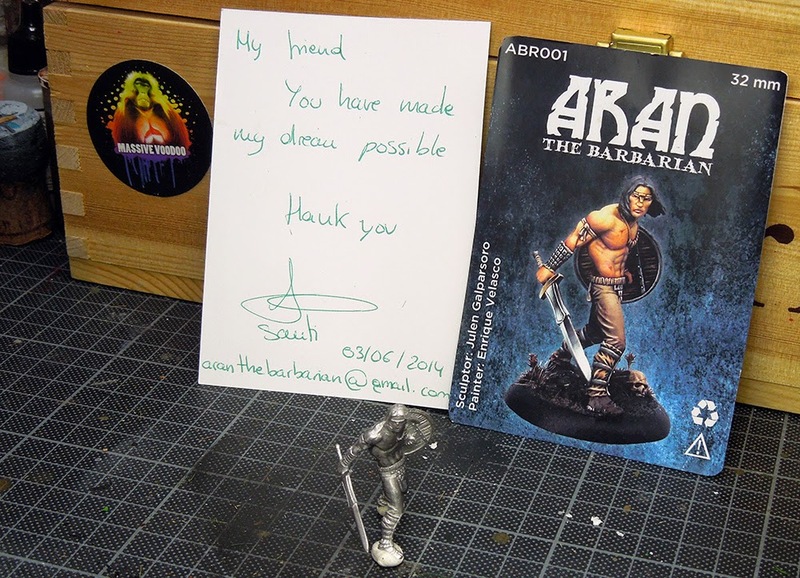 Thanks to Kurt for his guest presence in this article. 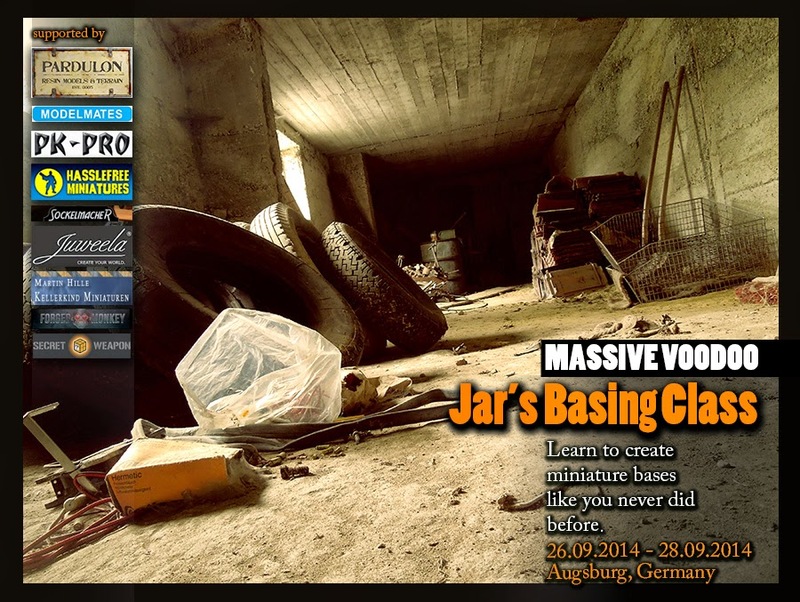 the second version of MV's Jar's basing class in Augsburg, Germany is up and open for registration. Actual status of the seats available is 11/18. As said, there won't be more classes with this specific topic and no basing classes from Roman until next year. So if you want to join, now is your time. The class is held in german language, but there is the possibility for non-german speakers to attend to the class too, if they are up to english language. With big thanks to Mike, the jungle now can offer those of you interested in taking part the full registration information in english language. today I am able to show you another finished project of mine. It is pretty hard to say it was fun as the theme/topic of this figure really makes me very sad. I got myself into reading a lot about the injustice that happened to the continent of Africa and no need to say it: still is on today. By reading a history magazin which explained the so far known depths of african culture and early history I really found myself stuck deep in a topic which ... ya, I got no words for what I feel about it, but I read on and discovered and learned a lot for myself. That is why I took the chance to put those feelings into a miniature to try to explain. 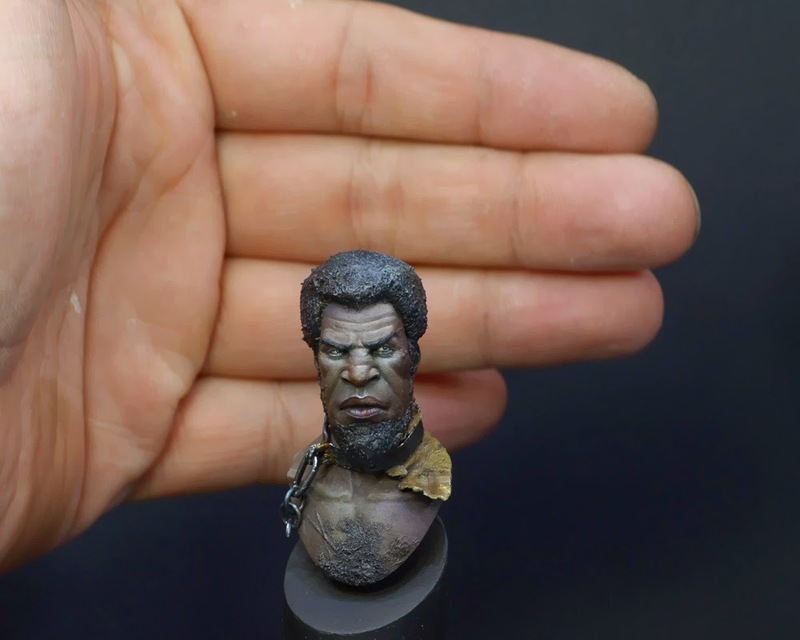 The bust itself is not big, rather small, but it was a joy to learn how to approach such a small but meaningful conversion, how to tackle to paint such a dark skin tone and well I truely learned a lot and prepared a full article about the project for our massive voodoo readers, coming to the jungle in future tutorial voting. I entered the bust in the 5th-Dimension's actual painting contest in category "Tall Tales", a category that is searching for story telling. 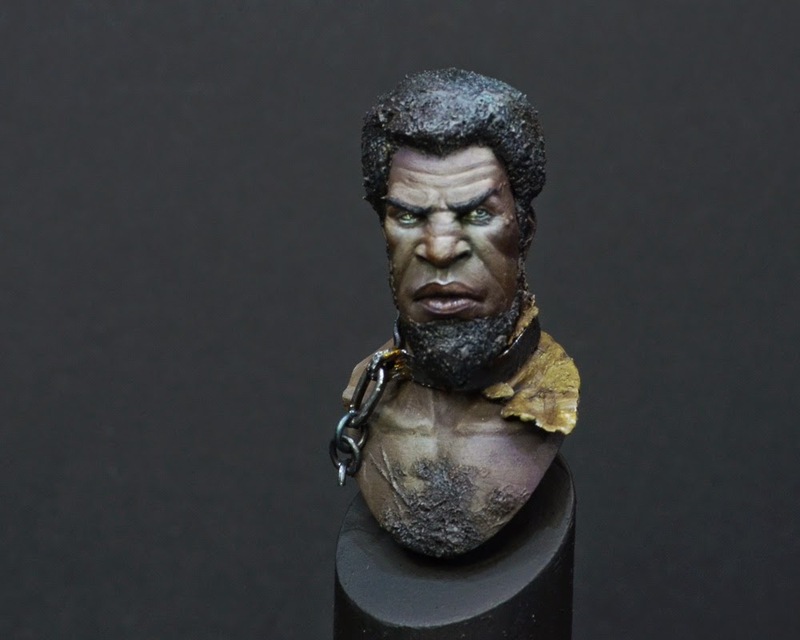 My personal thoughts on the topic are visible for me in the result and tell a story in this small bust. What do you think? 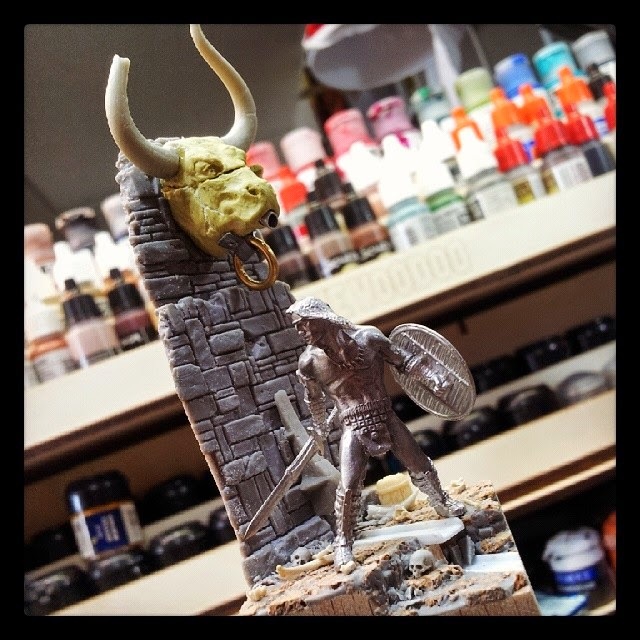 please follow the link to Putty & Paint. Keep on happy painting and a great weekend to you all! Another random prize pool update hits the jungle to keep you robot-forgers at bay! We hope you do not get distracted from the sun, help to make the Forged Hope Program come to life! 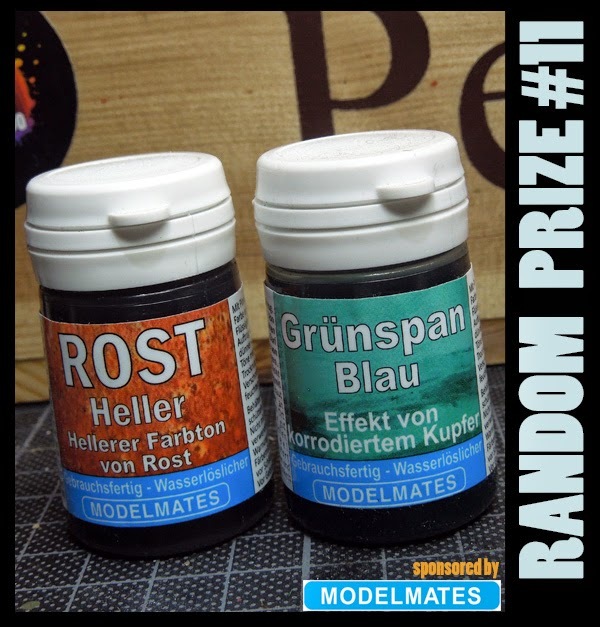 This update on the random prize pool is sponsored by Modelmates and brings one bright Rust Effect and one green Verdigris Effect to the lucky winner. Thanks to Modelmates! 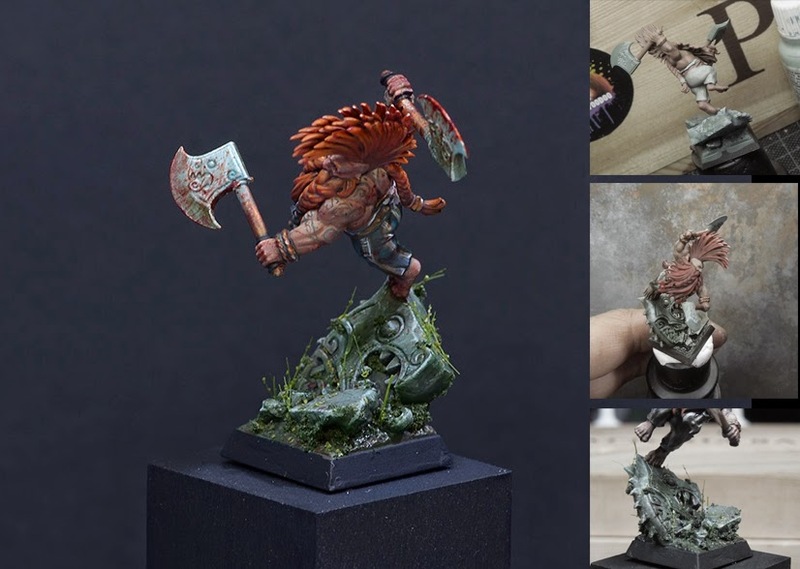 last Tutorial Voting made the Slayer win against two other articles and Massive Voodoo's year of the painter is proud to bring you an article about this model, painted by Roman..
We don't waste time with further blabla or yackidiyack, we jump right into Roman's thoughts. 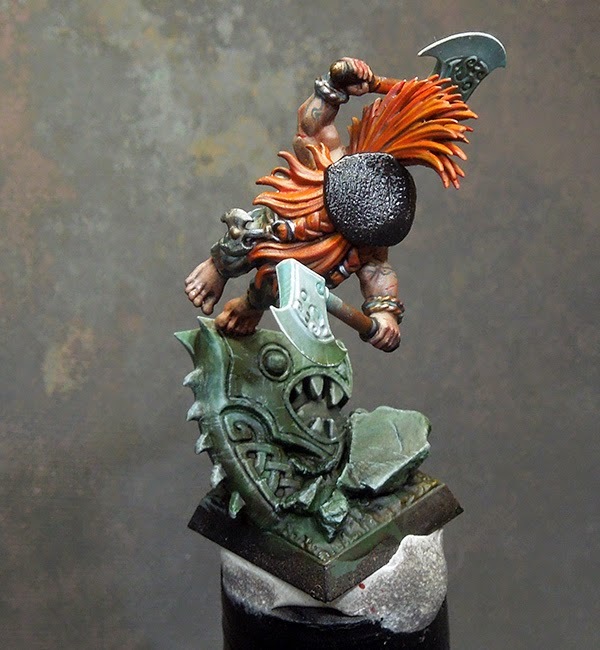 I was in the middle of finishing my version of Sha'un, Ram Tribe Warrior and very often if a bigger project comes to an end energies and will are fading away as the final work often gets annoying in such a large piece. 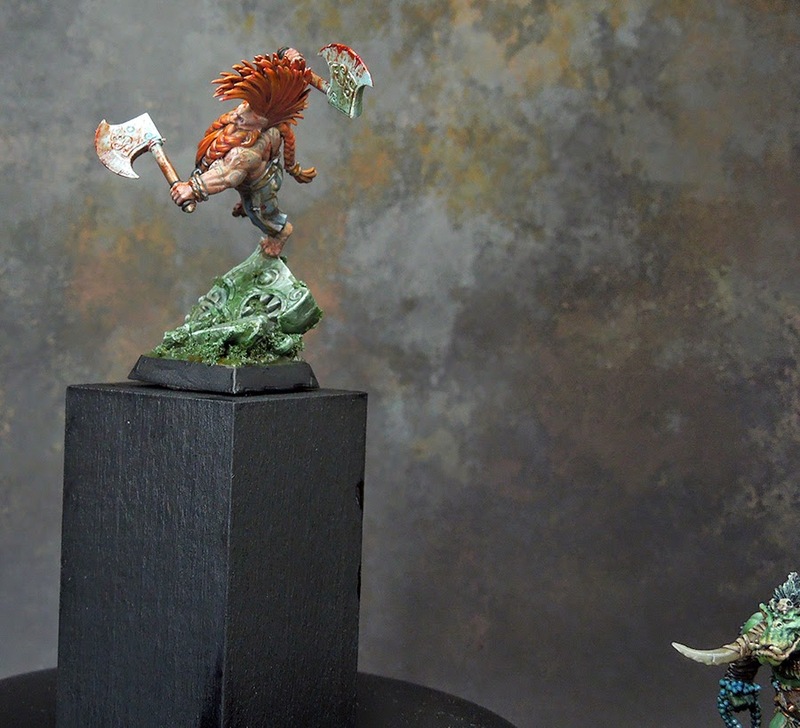 I was happy to have Peter and Bene doing a painting evening with me that particular day and I got distracted from the beastman bust. 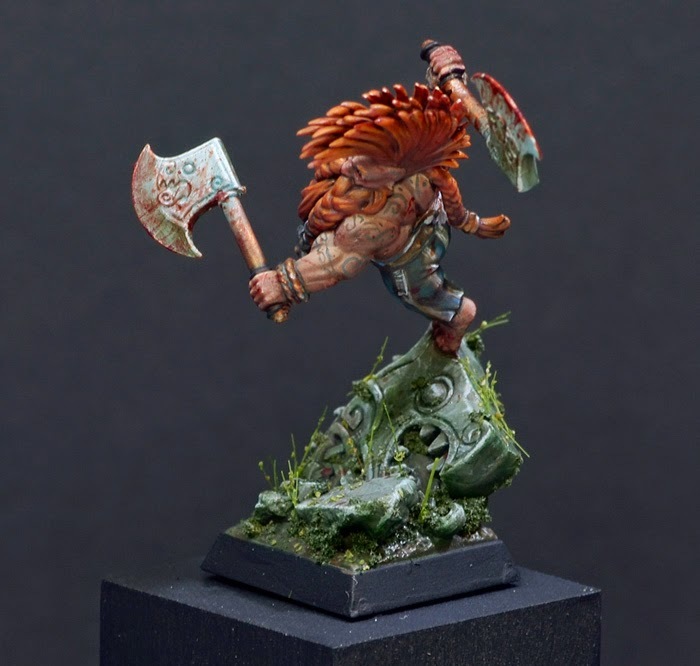 I was searching for something easy, something quick for relaxation and did choose to paint up a Slayer by Games Workshop. 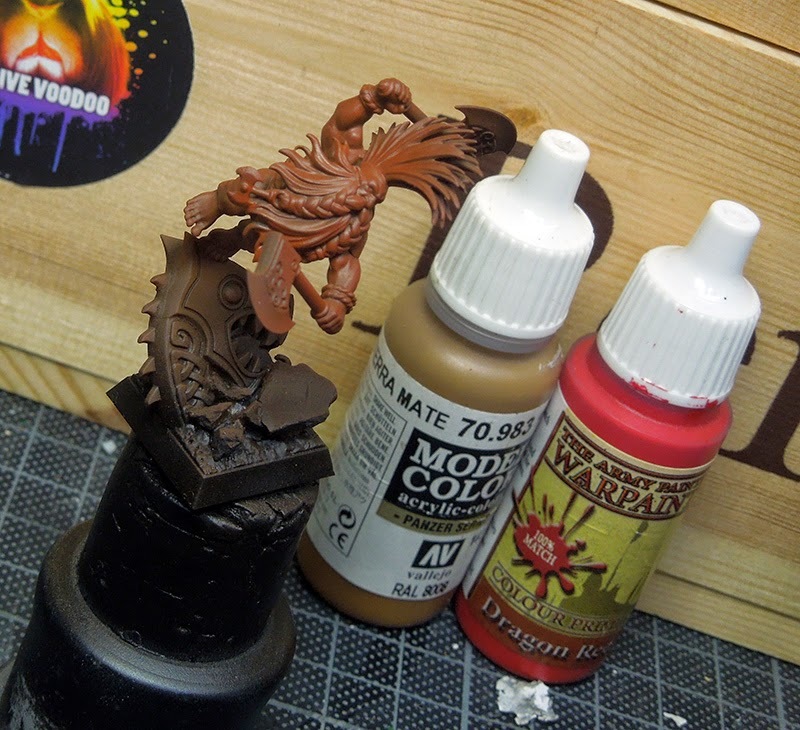 After I prepared and glued the Slayer right out of the box, I primed him black and used a mix of a sand colour and red for the basic tone to find into the piece. I did not grant any advantage with this colour, I just wanted to be able to quickly see where this might lead. This tone could be used as basic for the hair and the skin at once, at least this was the plan. 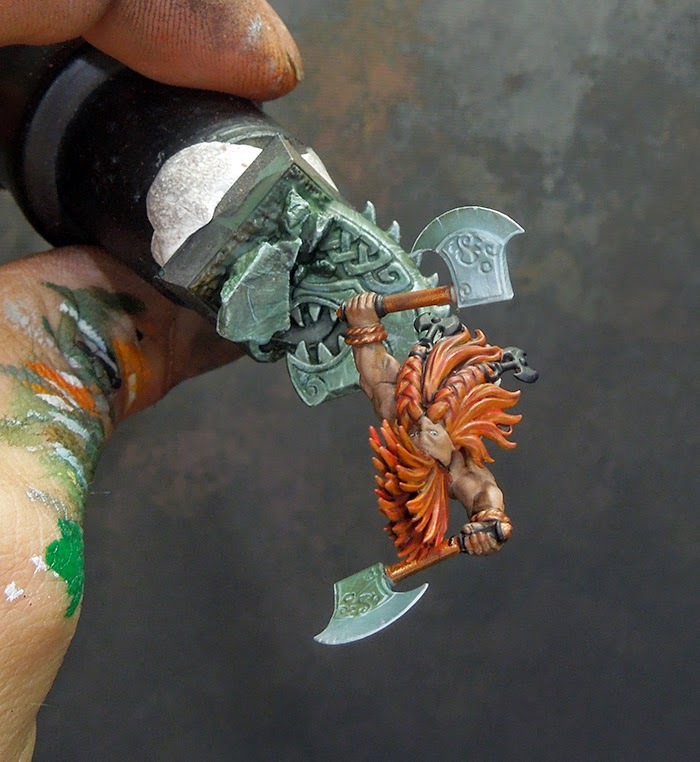 Use the airbrush for this step. 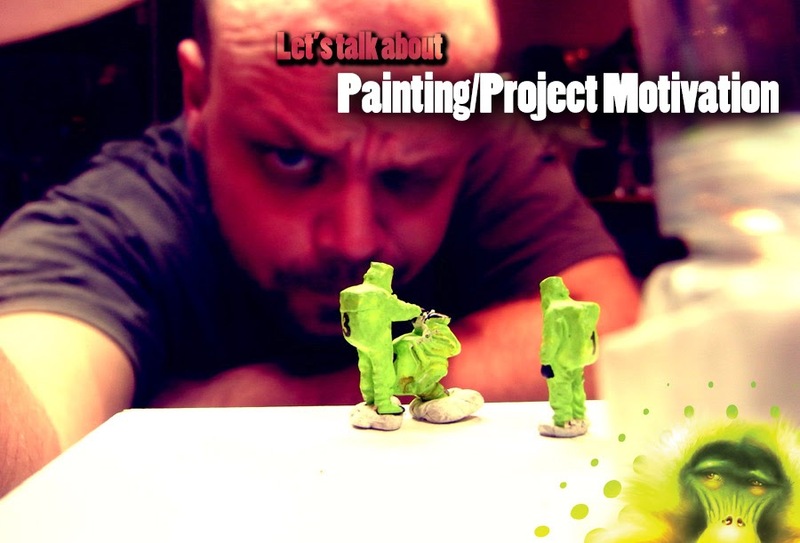 In such quick projects I do not think to much about what happens, I rather enjoy to paint without my brain occoupied. So the initial plan changed again. 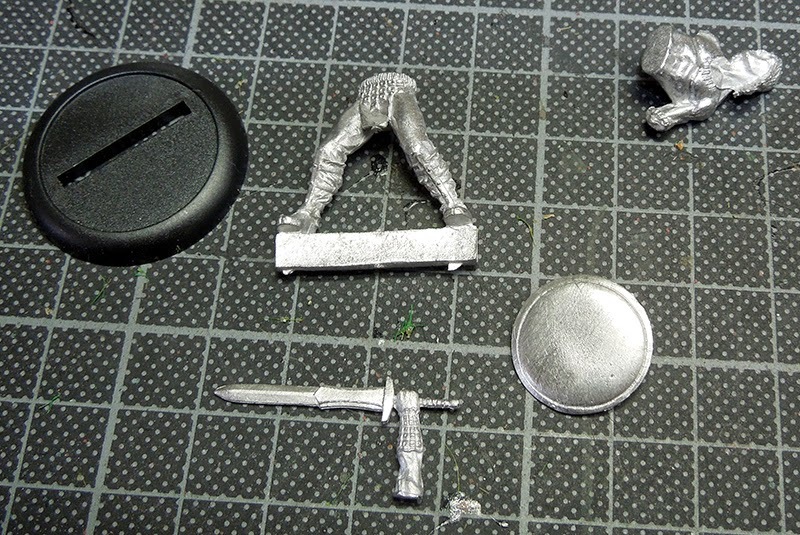 I airbrushed more natural skintone to the whole piece and afterwords did some rough paintwork on the trousers, stone and metal parts. Really slapping colour there, my basic tone was the neutral Fortress grey and while it was still wet I slapped in highlights with a stronger blue grey. 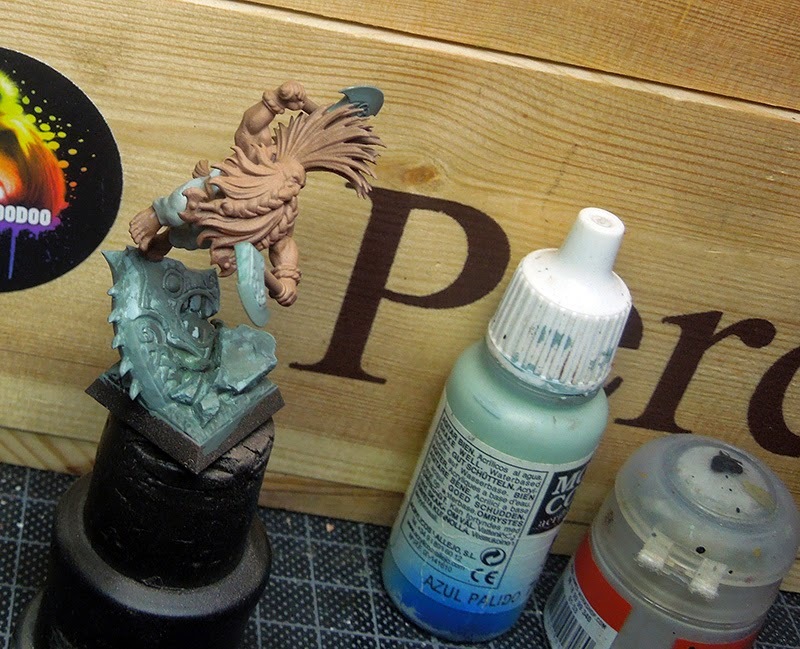 In this step I was already able to set highlight areas. Pow! Pow! 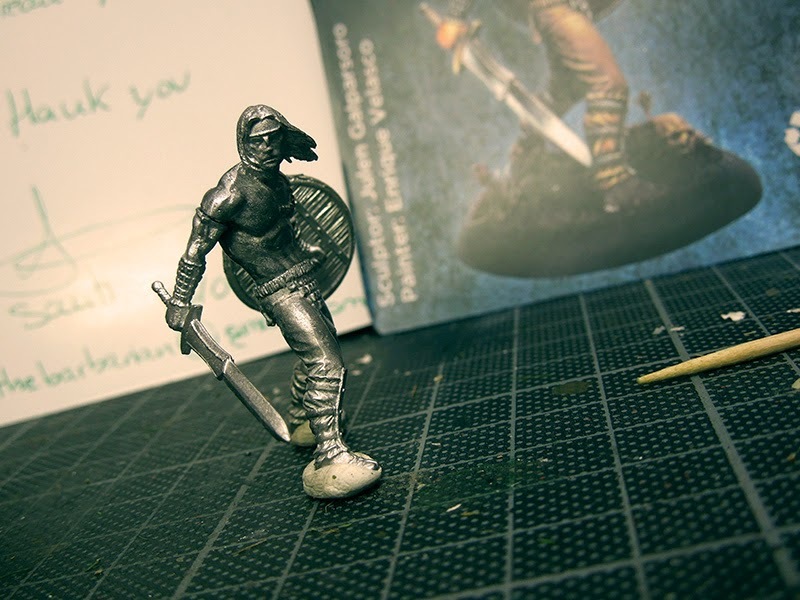 I did choose this figure to be an example for the different masking options article. So the next step was particular stupid. 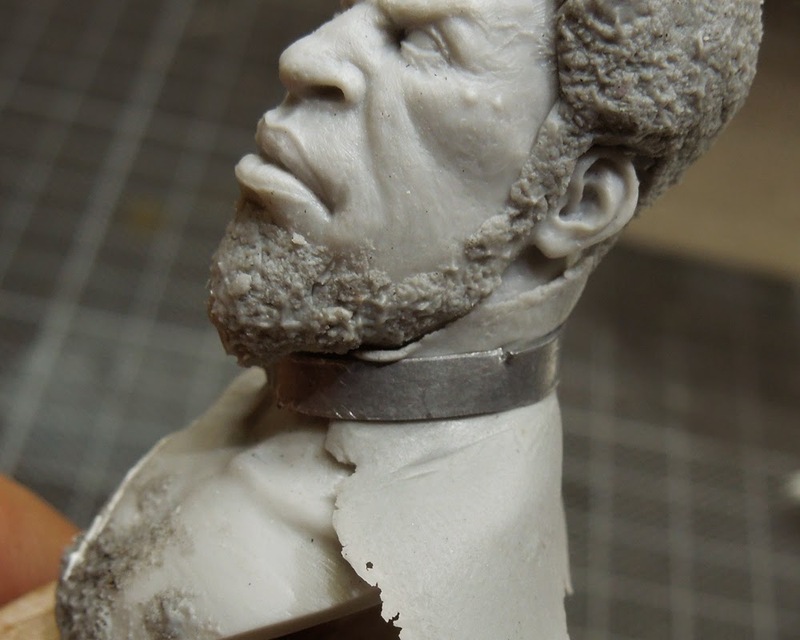 Hiding all the figure behind the masking tape just to spray the beard and mohawk in his basic tone, but it was fun and after the work with the Putty went pretty easy it did not feel as awkward as expected. After removing the masking tape I did paint the metal parts in bronze and painted stripes with a darker blue grey - it was the same colour as for the stone but with an additional black to it to darken it - to the trousers. Now it was time to bring in some depth. 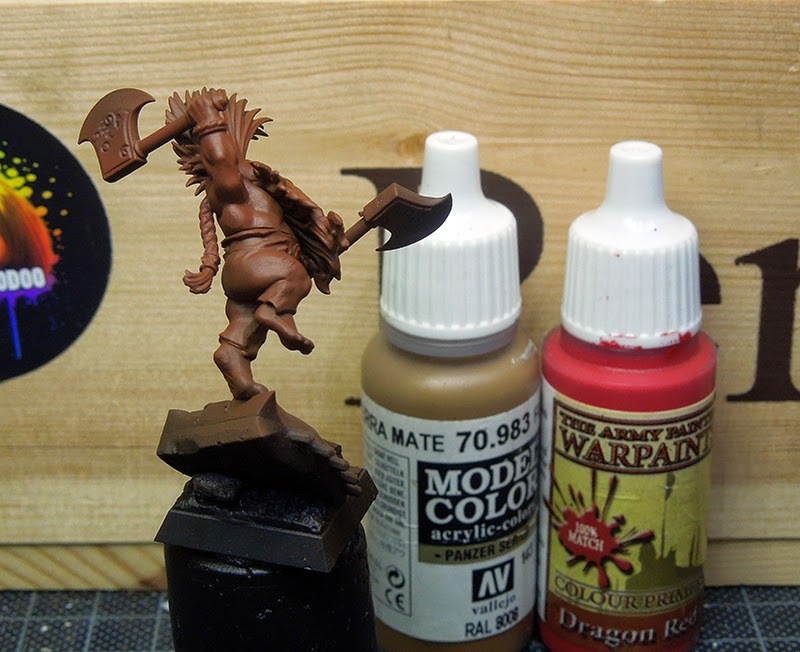 A quick way to do so I enjoy for fast projects is using Army Painter washes, mainly the Strong Tone. 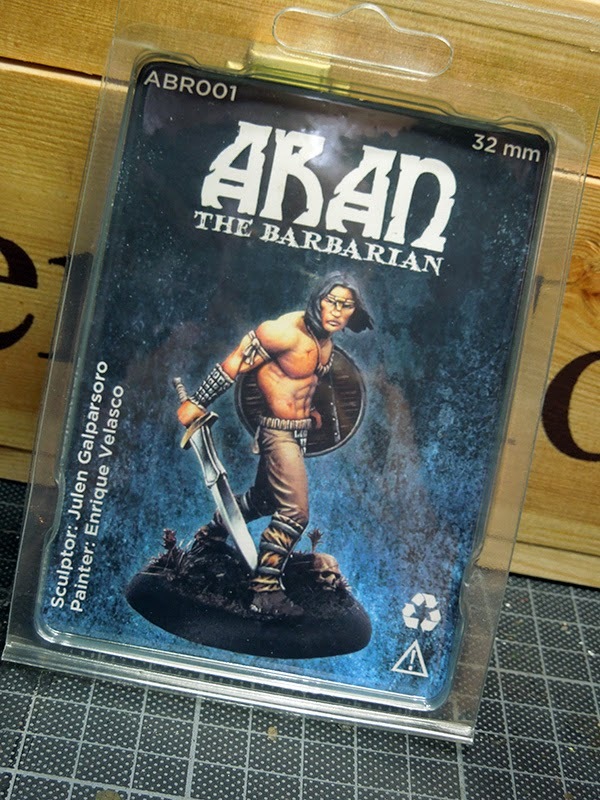 They are particular good as they dry out matt compared to other washes. 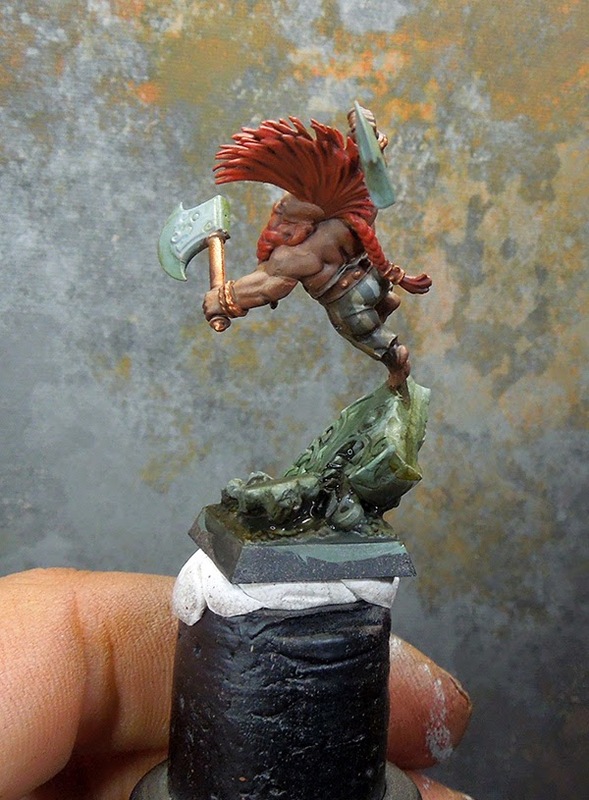 I used the brownish Strong Tone on the whoole figure and some of the Green Tone ont he base. To avoid a big mess try to bring it on with plan. The rules of zenithal light on where to place shadow helps me here. In the end it is still a mess, but a controlled one I can work on with. 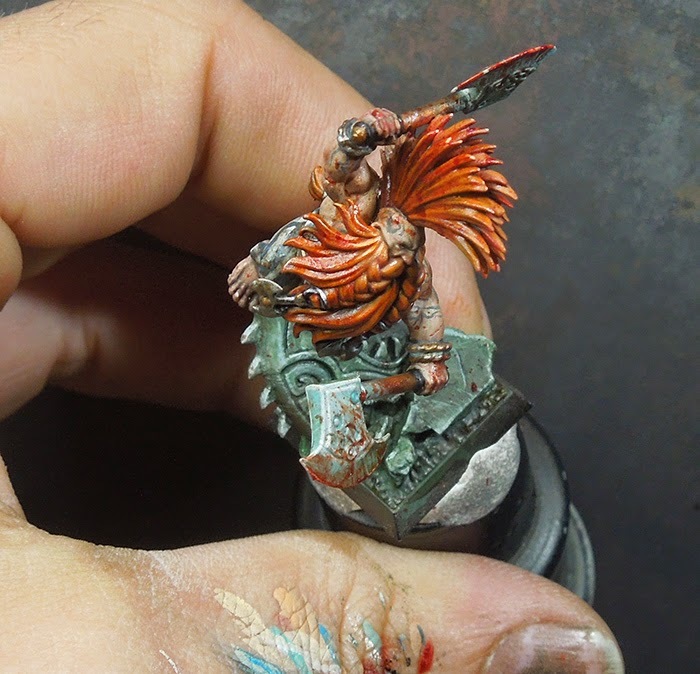 I don't fear the step of washing as I know the next step - cleaning it up with repainting base tones and adding the first highlights - is following after it. That is what I have done. 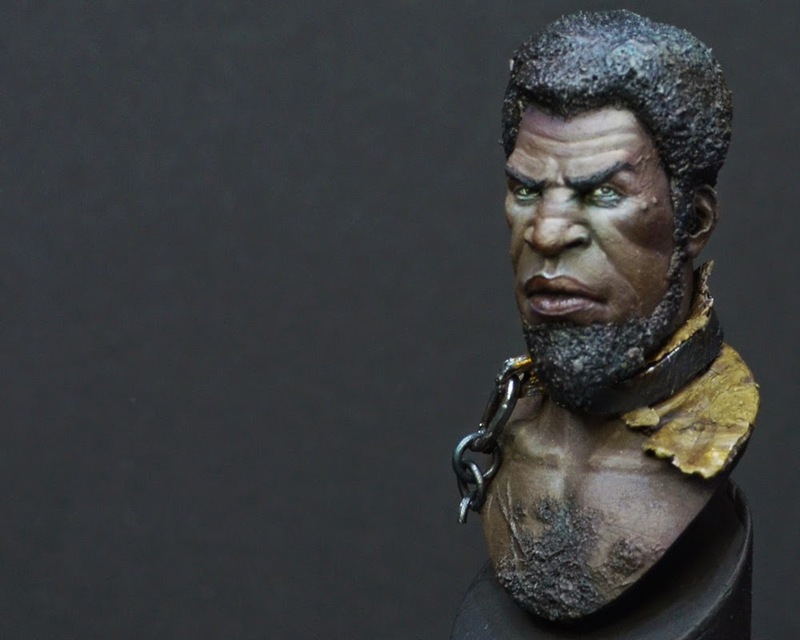 Using skintone to clean up the skin areas, added some highlights in the volumes hit by zenithal light. 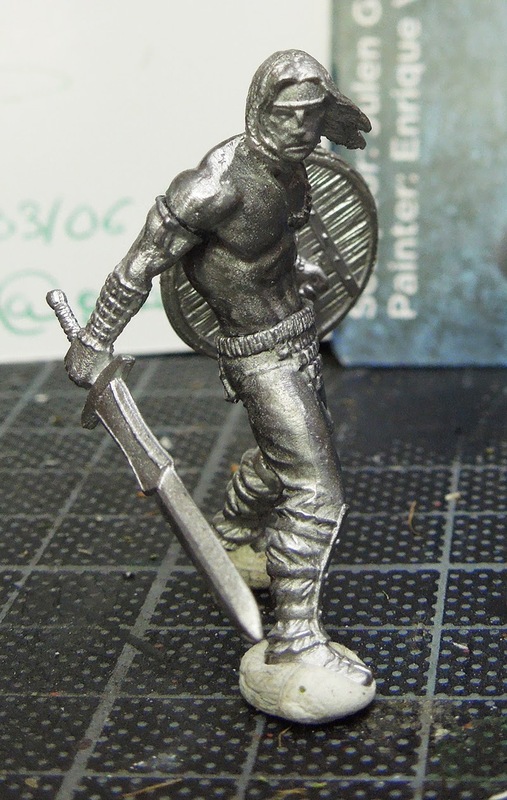 Same done to the hair, trousers and stone parts. Also on the bronze. 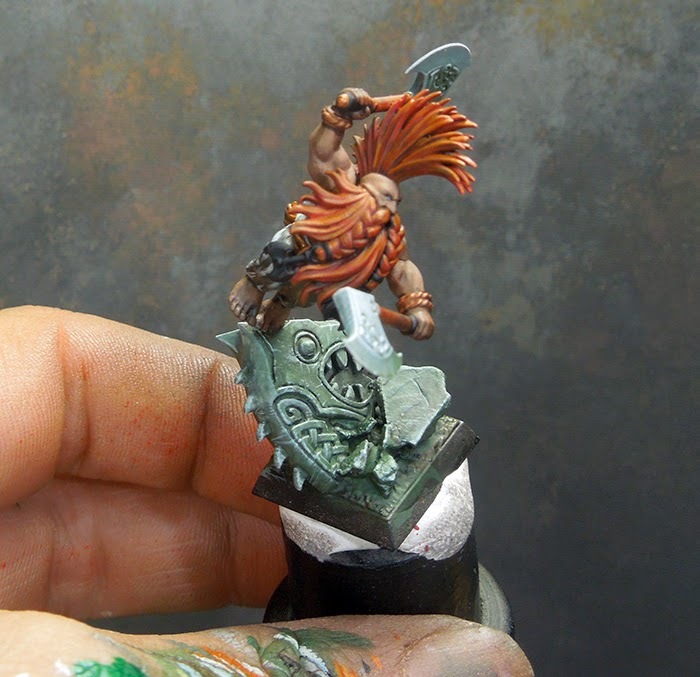 Upside down you can see how I used the glazes on the blades of the axes and how I reworked highlights there. On such quick projects I do enjoy to bring in texture as I do on long term projects, such can be achieved by using a brighter tone and dab it to the stone for example or painting thin stripes to a material. 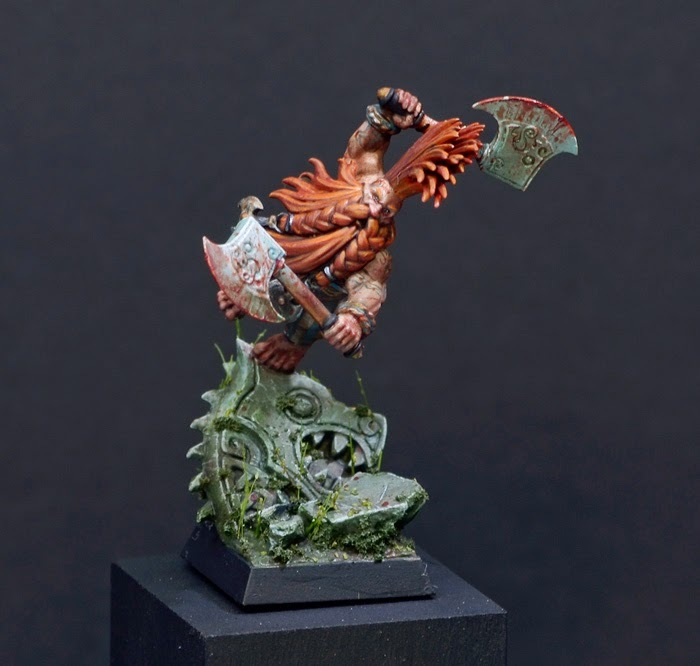 Meanwhile about 2~3 hours passed working on the dwarf and the three of us decided to do a in between photo of all projects under the brush this painting night. 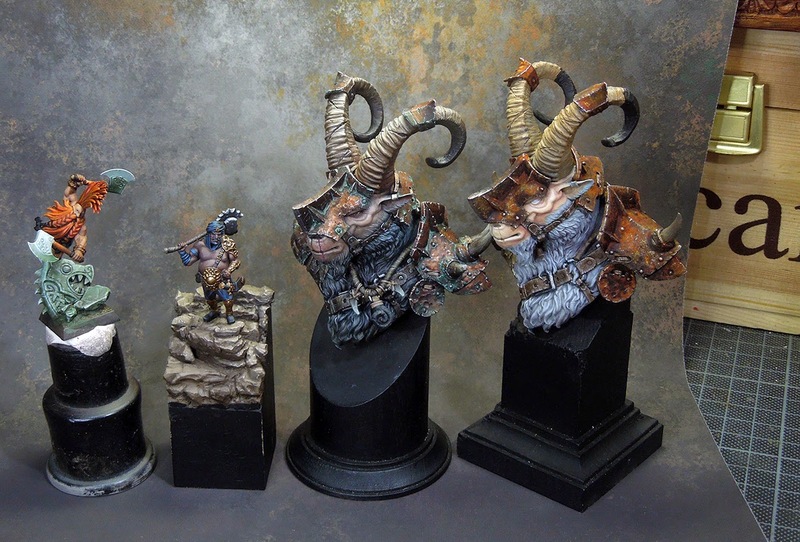 From left to right you can see the WIP-Dwarf, Bene's WIP of an upcoming Forged Monkey release, followed by my version of Sha'un in late WIP-stage and Peter's version of Sha'un during Work in Progress. Well, yes, blood. 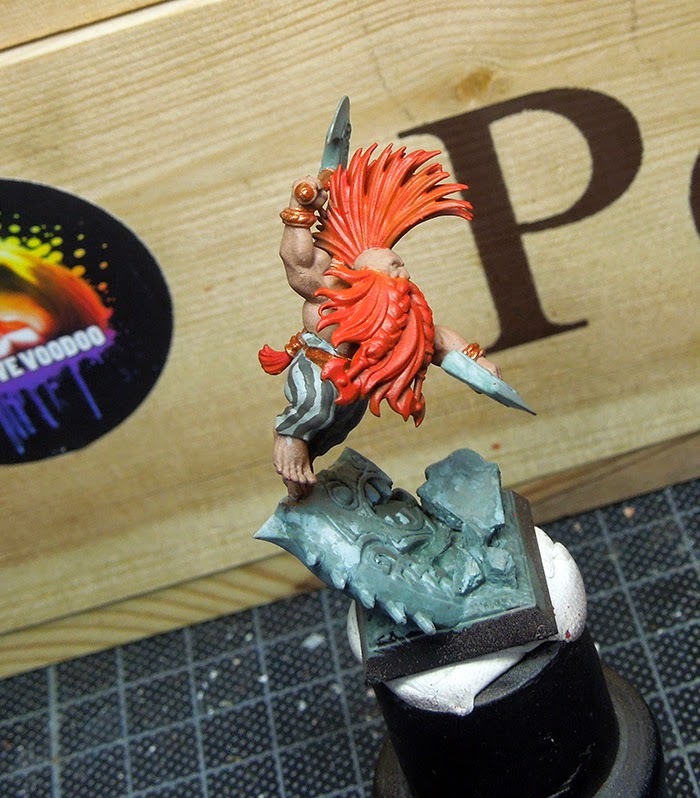 I used the airbrush and some of GW's new technical blood colour to spray it to the figure to make him look jumping right out of a slaughterhouse. 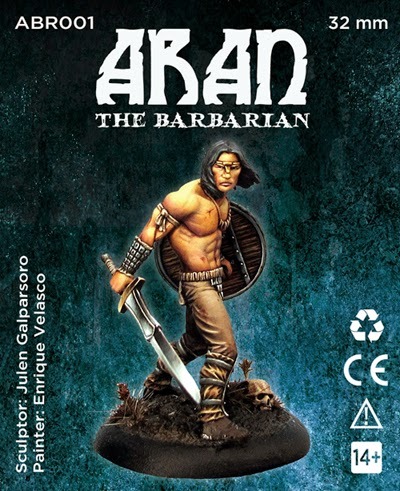 I mean he is a slayer, he is supposed to look like that in battle. I decided to secure the face with masking putty to have no big accidents here with the blood. The basework recieved some more controlled green washes to make several areas look more interesing. 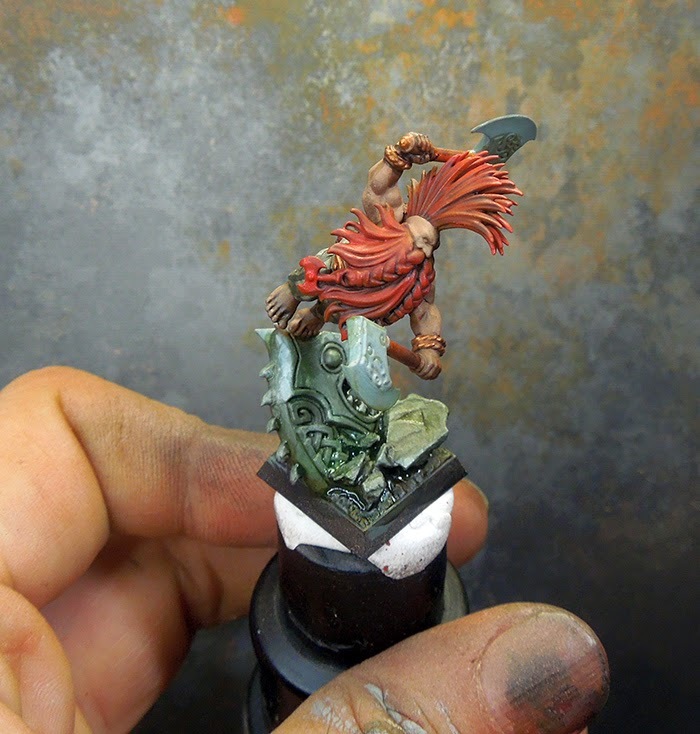 Even added a drop of black colour to the green wash to have it darker in the lowest areas. 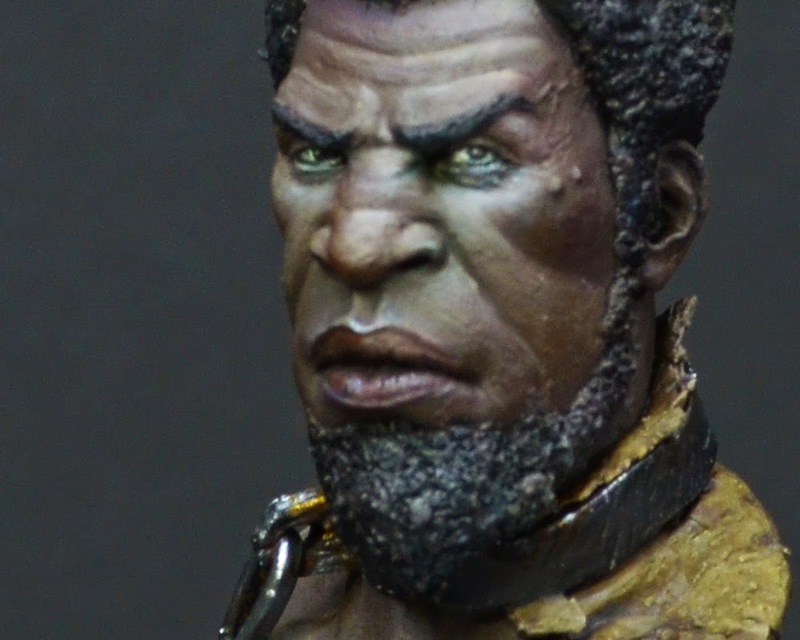 In this step I also painted his trappings in the beard in metal tones. Now to blood. Spronngggeeee! Splloouuurrppp! Cool, not. It went pretty shiny on his beard. 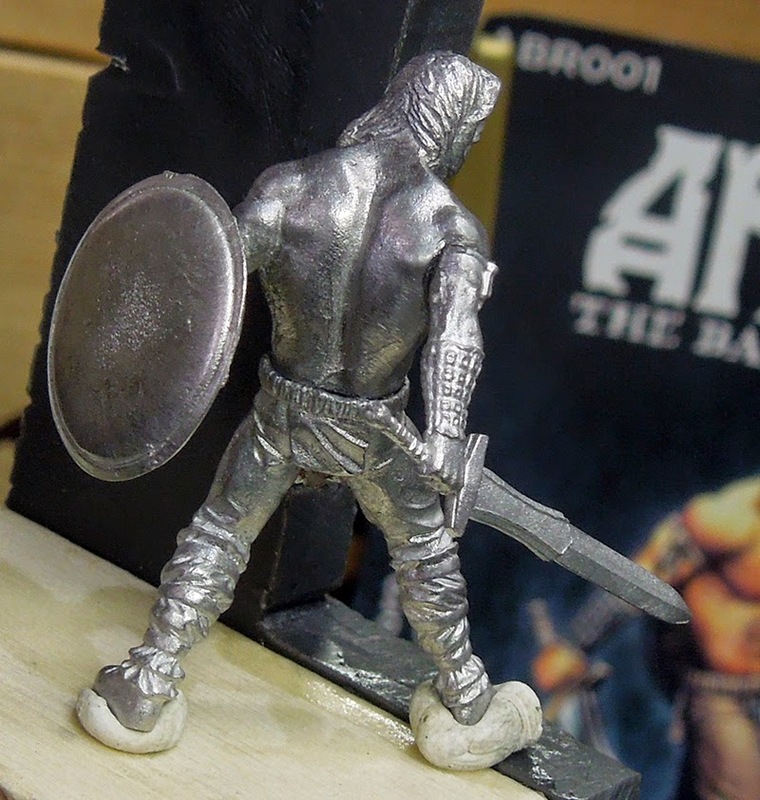 I used the brush to create tiny scratches here and there, little wounds to our little hero. Next step was adding moss to the base to underline the greens I have painted before. You might recognize, that even without a perfect plan there is always a bigger picture to think of. Photobomb. 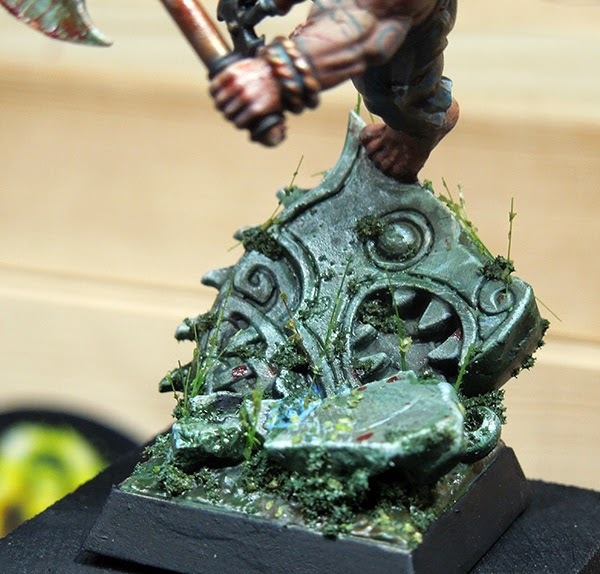 Next step was using some grass pieces of the company Polák, but only single ones to be added to the moss. A small detail that looks interesting in the end. as it leaves no traces or accidents like superglue sometimes does, it just disappears. 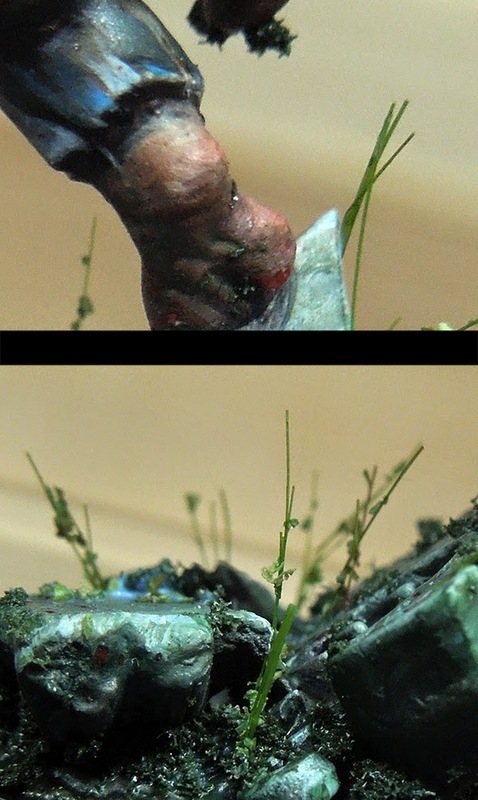 I added some dirt and small moss parts to the feet of the slayer to make him look authentic running through hsi environment. Last steps were adding a stronger shadow here and there or adding a final highlight here and there. I'd say this is how the quick painted Slayer was done. 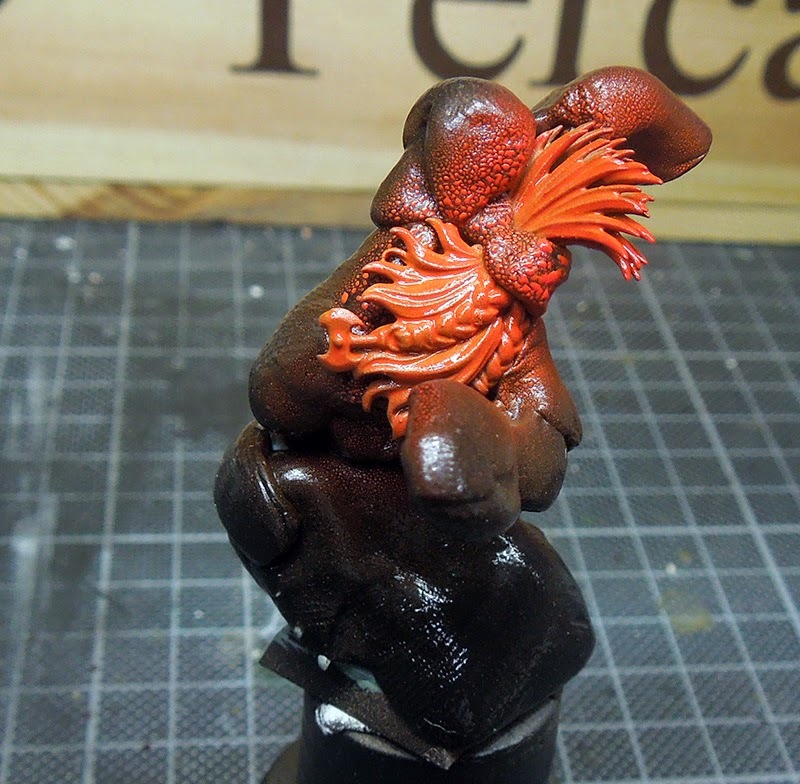 The last thing I did was using the airbrush and matt varnish to get a grip on the shiny beard, caused by the blood accident and lucky me - it worked well. More photos can be seen here! 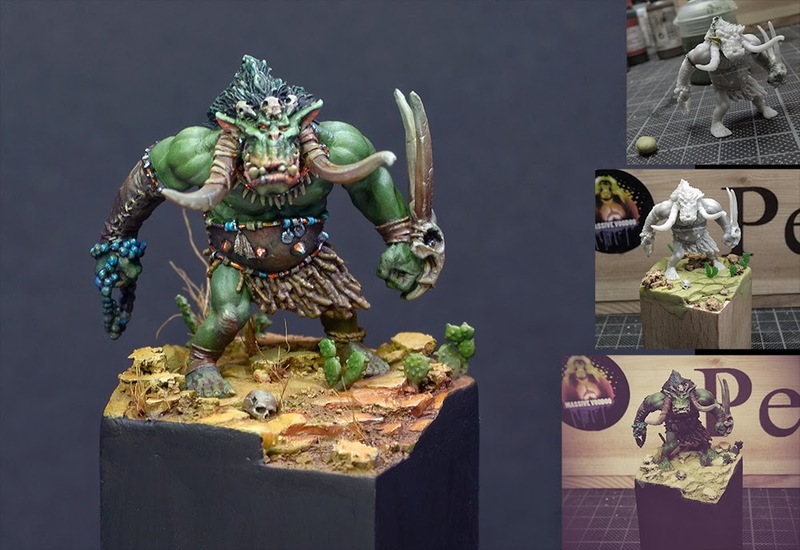 This quick model really helped me to relax and to get back to the beastman once more for the though work there that drains so much energies. Thank you Slayer. Never underestimate the healing powers of a quick project, healing power for your mind and heart. - Think ahead: Don't worry if at one step something looks awkward, don't get distracted or frustrated by it. It will change to the good when you paint on. In the best case you already know what you are doing and what will be the next step. Don't worry too much, have fun and be self-confident. I hope you enjoyed the article, let me know what you think and if you got questions please feel free to ask them via comment.